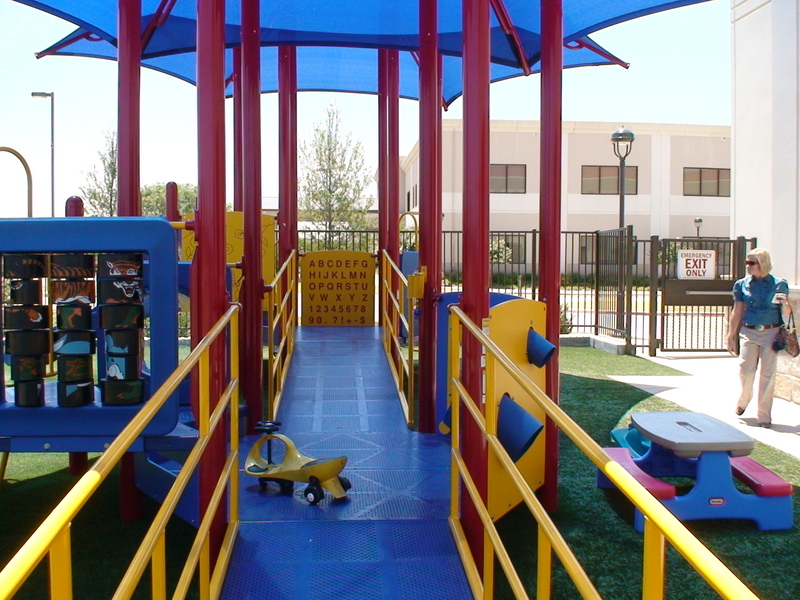 The outdoor flooring and play structures were created by Child’s Play Inc. 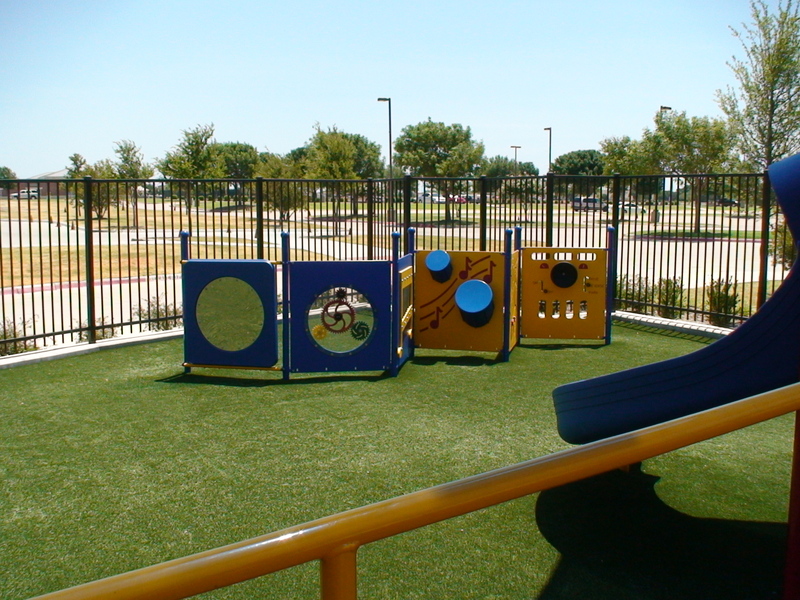 This company has installed play structures for a number of schools and churches around the Dallas/Fort Worth Metroplex. 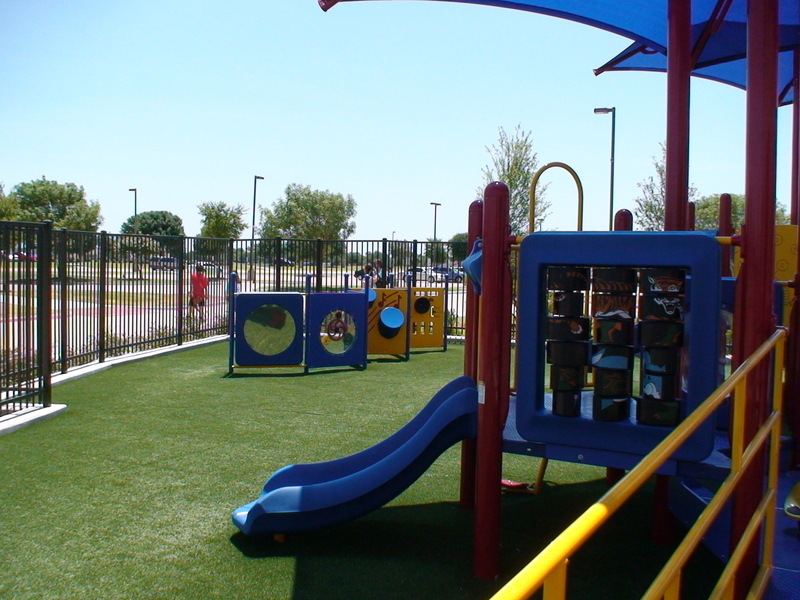 Stonebriar’s special needs playground was designed to include climbing structures with the idea that typical kids would be able to have just as much fun playing alongside the kids with special needs. 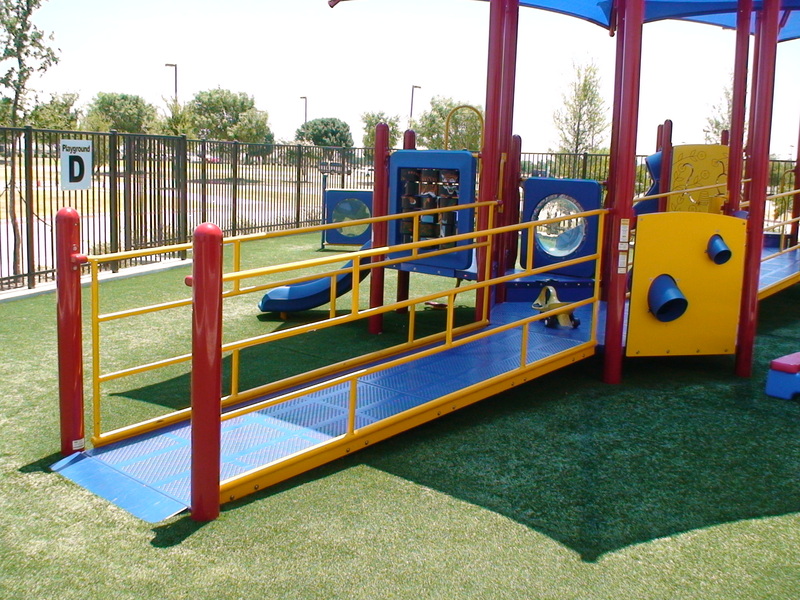 While you might not expect to see any areas that require climbing or steps on an “accessible” playground, Meaghan shared that a number of their students that utilize chairs or walkers actually enjoy going up the small steps with the help of volunteers. Experiences like this allow them to feel “typical”. Meaghan points out the importance of providing stations at several different elevations, giving more height options than a typical playground. Making some activities accessible to a child who gets around by a wheelchair, crawling, or scooting is important. Selecting flooring that stays cool and is somewhat comfortable is important for the children who pull themselves or crawl along the ground. Concrete flooring is harsh on both knees and pretty dresses. 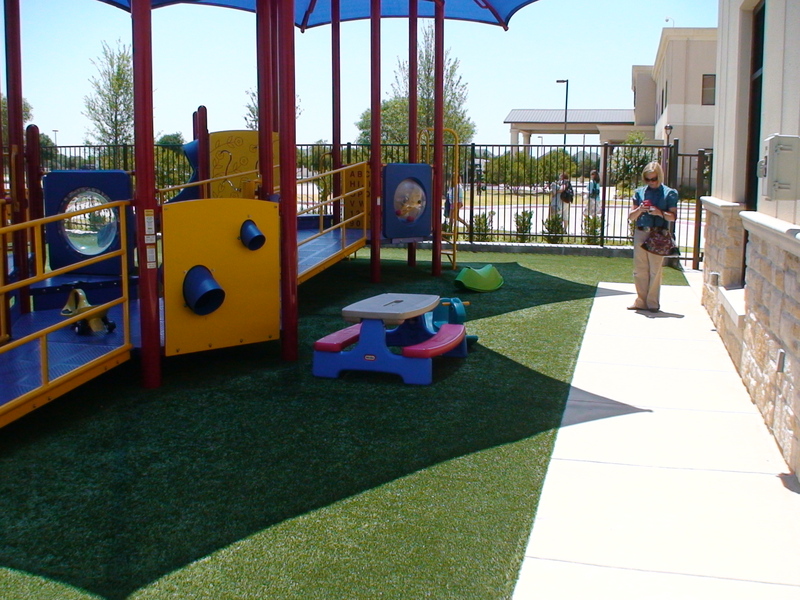 The turf that was selected for this playground allows those children to crawl or scoot along the ground without getting their skin scratched or their clothes dirty. 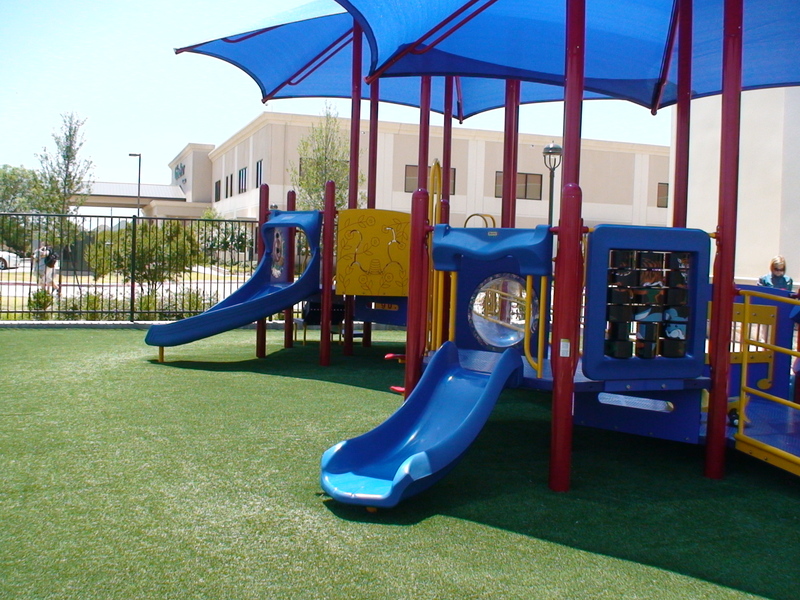 The artificial turf is also specially designed to be cooler than concrete or other surfaces. On this 100+ degree weather day, I tested the temperature of the turf with my bare feet. Without a doubt the turf was much more tolerable to the touch than the nearby concrete. 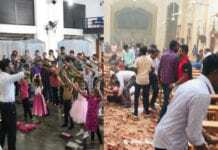 Also, the church went to great lengths to investigate and install a subflooring below the turf that absorbs shock. 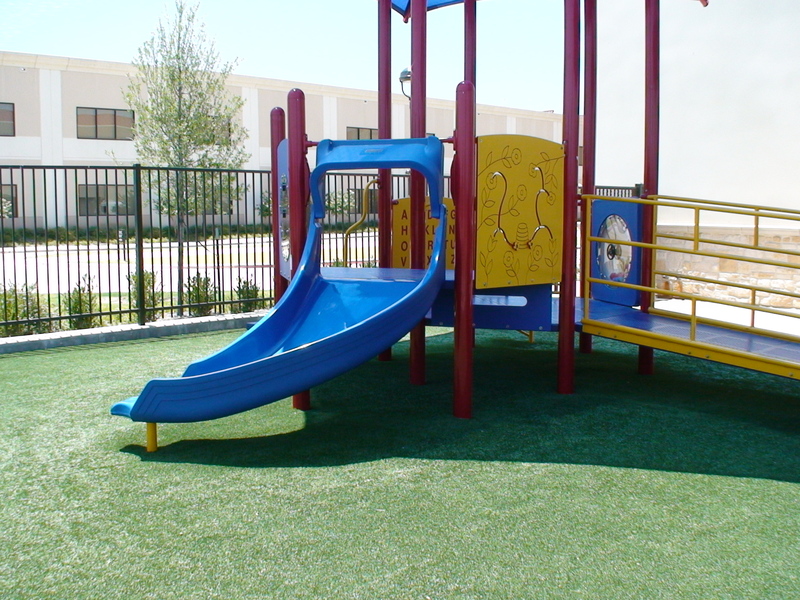 Meaghan shared that the subflooring installed on this playground (not visible) helps to prevent serious head or bone injuries in case of a fall. Coverings are also very important. 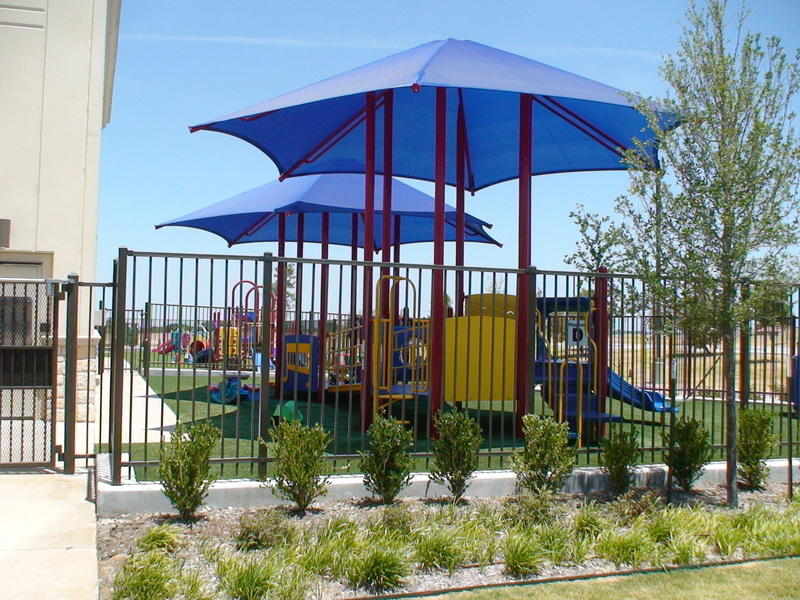 The canopy allows the participants to use the playground even in the hot Texas sun. Shade is extremely important, not only for the heat aspect but also to prevent sunburn. Keep in mind that many children with special needs have very sensitive skin and a sunburn may be more serious to such a student. Meaghan pointed out that there are no swings on this playground – nor on any playground on the church campus. Not only is there a space limitation, but the risk is considerable for injury. Swings pose risk to the child on the swing as well as those those running around/near the swing. 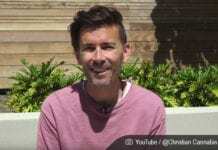 What playground pointers can you share? We’d love to hear from you! Previous articleTeaching to the Crowd. 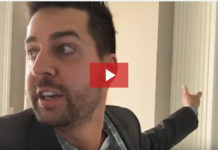 Who is Your Audience? Amy Fenton Lee is a writer and speaker focused on helping churches successfully include children with special needs. She is a regular contributor to children’s ministry publications and a variety of other Christian and secular magazines. Amy is a passionate children’s ministry volunteer and the daughter of a church senior pastor. 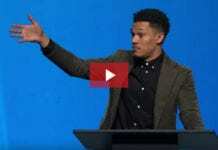 Amy is a frequent speaker at children’s ministry conferences. 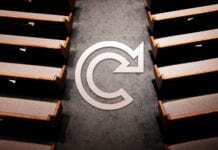 Amy blogs about special needs inclusion at The Inclusive Church.